2018 Bob Hawke Landcare Award winner, Charlie Arnott. New South Wales biodynamic farmer and grazier Charlie Arnott was honoured at the 2018 National Landcare Awards as the winner of the prestigious Bob Hawke Landcare Award. Charlie was chosen amongst an exceptional group of finalists which included Victorian farmer Simon Falkiner and Tasmanian poo-ologist Dr Graeme Stevenson. With a $50,000 prize package, the award enables Charlie to further develop his knowledge and skills in Landcare and sustainable land management practices. Charlie was ecstatic to win the prestigious award. “The other finalists, Graeme and Simon, have made such huge contributions to Landcare, and both have had a positive impact working with their local communities,” Charlie said. By winning this award, Charlie hopes to inspire more farmers to adopt organic and biodynamic practices on their properties so they too can benefit from enhanced landscape biodiversity, healthy plants, and animals. He also plans to use his award to facilitate more on-farm workshops and training for farmers and others interested in biodynamics. “The biggest impact I can have is teaching farmers how to do things differently,” Charlie said. “I’m a firm believer it’s much better to give a man a fishing rod and teach him how to use it, rather than just giving him fish. Helping other farmers to focus on what we can control is the biggest barrier. 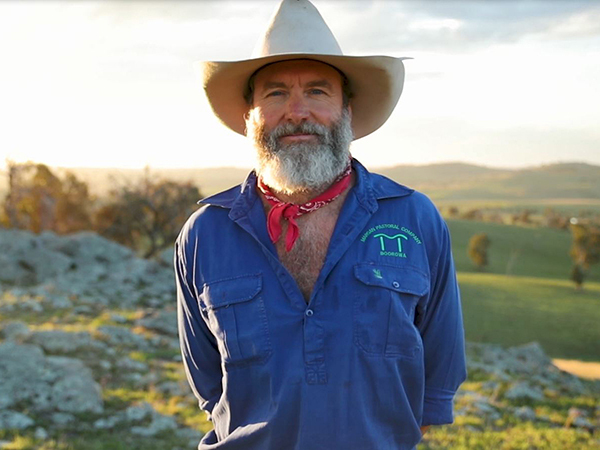 Charlie practices regenerative farming, organic, biodynamic and holistic grazing principles on his 5000-acre mixed farming property, Hanaminno, at Boorowa NSW. Passionate about growing clean, healthy meat, Charlie’s approach and practice of biodynamic and holistic principles demonstrate every aspect of the Landcare ethic. The Bob Hawke Landcare Award is not the first time Charlie’s farming practices have been recognised. He has won several agricultural industry awards for leadership, resource management, and conservation. Charlie has been an active Landcarer since the inception of the Landcare movement in 1989, with previous roles in all levels of Landcare, from district groups to the Sustainable Farming ambassador for Landcare Australia.